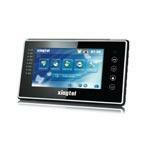 TCP/IP：Intercom System - Intercoms - Xingtel Security Xiamen Co., Ltd. Supplier: Xingtel Security Xiamen Co., Ltd.
TCP/IP system uses TCP/IP protocol based on existing LAN, with no distance limitation and no need to configure with extra devices and accessories. It integrates the functions of building intercom, message announcement, home management, security alarm, information services and multi-media such as MP4, photo frame, alarm clock and so on. Users through the indoor monitor can set the alarm station and control the lights, air-condition and so on. TCP/IP system supports remote upgrade keeping up with the latest system and automatic fault detection which reduces labor cost. It is easy to install, using international standard RF45 socket and network switch.